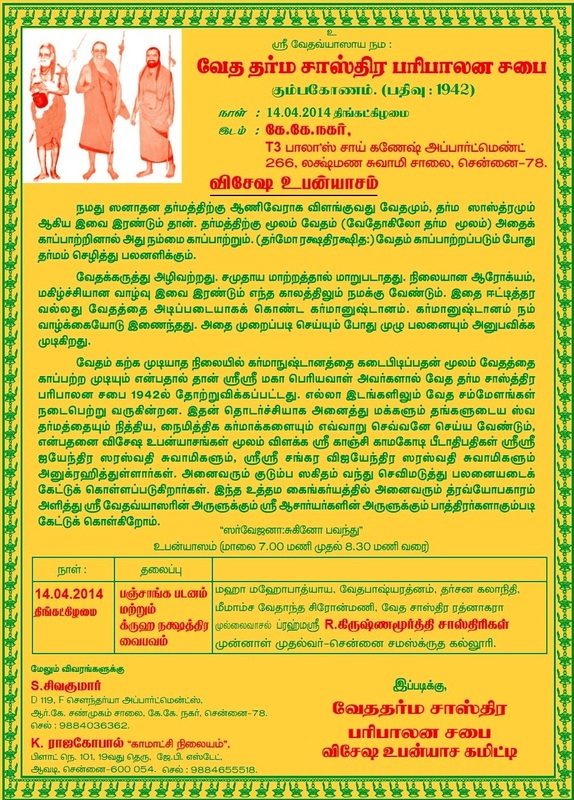 With the Blessings of Pujyasri Shankaracharya Swamijis of Sri Kanchi Kamakoti Peetam, Veda Dharma Shastra Paripalana Sabha is organizing a Special Discourse on Panchanga Patanam and Graha Nakshatra Vaibhavam" from 7-8.30 pm on 14 April 2014 - Tamil New Year's Day - at KK Nagar, T3 Bala's Sai Ganesh appartment, 266 Lakshmana Swamy Road, Chennai 78. The sabha was established by Pujyashri Maha Periyaval in the Year 1942 to conduct Ved Smmelanams in Tamil Nadu and other neighboring states. The First Upanyasam was performed by Bhrahmashri Sengalipuram Anantha Rama Dekshidhar at Kumbakonam. 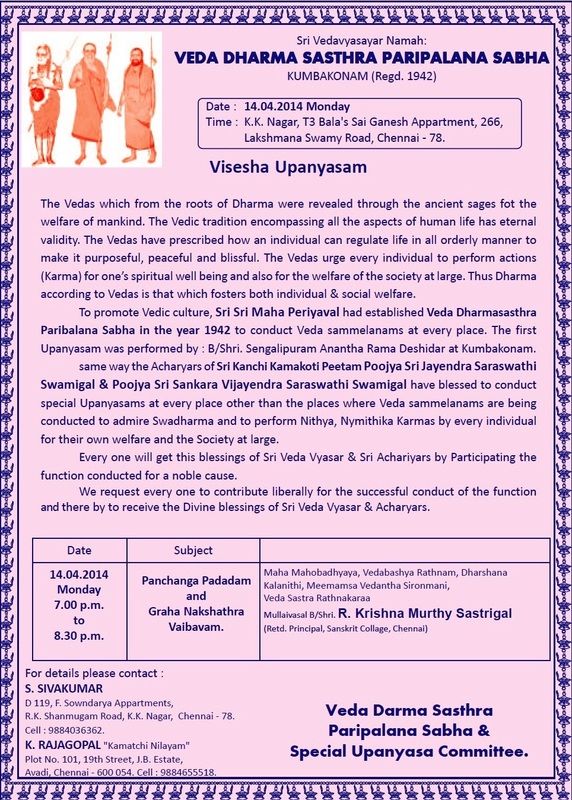 The Acharyas of Sri Kanchi Kamakoti Peetam Poojya Sri Jayendra Saraswathi Shankaracharya Swamigal & Poojya Sri Sankara Vijayendra Saraswathi Shankaracharya Swamigal have blessed to conduct VISESHA UPANYASAM's at different places focusing on Swadharma and to perform Nithya Nymithika Karmas by every individual for their own welfare and to the Society at large.